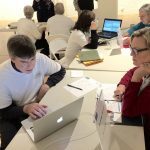 The newly updated Swedish American Genealogical Society hosts presentations from 10 a.m. to noon the fourth Saturday of the month (exceptions may apply due to holidays, availability of speaker). Check the Museum calendar for the most updated information. These presentations are free to members of the Museum Genealogical Society. Non-members pay $10 per presentation. Payment is accepted at the door. Genealogical Society members: No fee for first hour; $10 for each additional hour on the same day. Museum member only: $10 for first hour and $30 for each additional hour on the same day. Please call the Museum at 773.728.8111 or e-mail genealogy@samac.org to make an appointment. Individuals with appointments have priority over walk-ins. 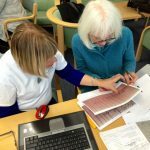 Please fill out a genealogy research request form here if you are unable to attend an in-person genealogy research session. Forms can be returned to us electronically to genealogy@samac.org or faxed to 773.728.8870. Based on the information you provide, we will research using the resources available at the Genealogy Center. Information might be available within three weeks. If we are unable to assist you, we will try to refer you to other possible sources.